This was not an easy process. The goal here illustrates the fact that free agency classes can be fickle, to say the least. Which free agents will provide the biggest point per dollar return? Better yet, which ones will not end up in the buyer’s remorse category? Those were two major factors to consider. Age is another big aspect as far as pre-prime, prime, near past prime, and past prime. First things first, we wanted to consider the oldies but goodies. These players are well past the age of 35. Apparently, more free agents are near, at, or over this number than expected. Expect the unexpected here as far as age, dollar amounts, and more. Here are three of the most sought-after free agents from the 35 and up defensemen category. Orpik pondering the free agent market in 2019 could be intriguing from a where could he go standpoint. His price tag will be cheap more than likely. Though his metrics are vastly improved from last year, some still are below average. For example, Orpik carries +1% relative to Corsi and Fenwick. However, the on-ice save percentage (5 on 5) is just .891. That is well below league average. The good thing is Washington believes they have some leverage here. Orpik fits well in the Washington system. Typically, he plays 18 minutes a night or so. Ideally, he can still be a somewhat effective penalty killer still while logging third pairing ice time. He’ll earn $2.5 million for the 2018-19 campaign. What could he make for 2019-20, if he chooses to return? The projected cap next season allows Washington or other teams to pay him around $1.5-$2.5 million. Anything more is likely too much and a possibility exists for less. This depends on Orpik’s health and play goes for rest of season. Hainsey presents a weird case in the sense that he has not been terrible this year. Some of his metrics are off the charts good in the early going (including a near 105 PDO at even strength). Even his relatives to possession are near average (about a fraction of -1% to team average). On the other hand, Hainsey gets remembered more for the glaring mistakes he makes than the plays he does make. It is clear he has lost a few steps. However, his ability to be serviceable will garner some interest from other teams. He chips in the occasional offense as well. Hainsey had 23 points last season and is on pace for potentially 30 points this year. Hainsey earns $3 million for the 2018-19 season. What may he get paid for 2019-20? Would Toronto entertain a one year deal perhaps? Other teams might ponder that as well. It becomes a question of what dollar amount gets attached. Hainsey may see anywhere from $1-$2.5 million depending on how the market runs. If it is frigid, his value goes close to his current salary. If not, Hainsey sees more around the lower end. Likely, Chara’s chances of testing the free agent market is quite low. Chara is expected to sign a one year deal or retire. However, one never quite knows sometimes. The fact remains that the defenseman still has an above average shot from the point. He also plays nearly 23 minutes a night. At his age, that is impressive! The good thing is Boston believes they can retain Chara’s services for another year at least. 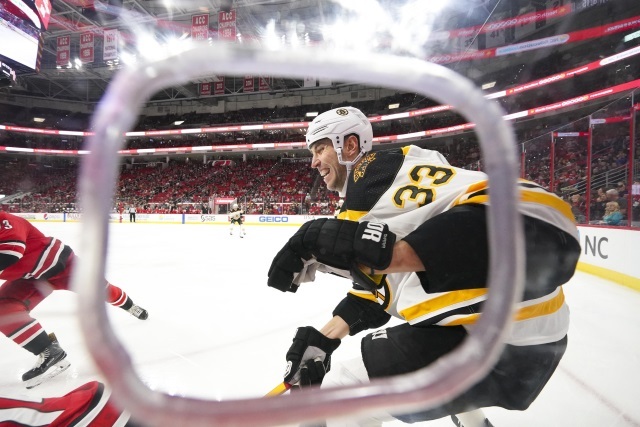 Chara’s price tag expects to come down a bit for the 2019-20 campaign. It may not be much. He’ll earn $5 million for the 2018-19 campaign. What could he make for 2019-20, if he chooses to return? The projected cap next season allows Boston to pay Chara anywhere from $3-$5 million. No one honestly knows but clearly, the Bruins blueliner can still play in this league.